For those who would like to learn more about lighthouses, below is a list of suggested books. 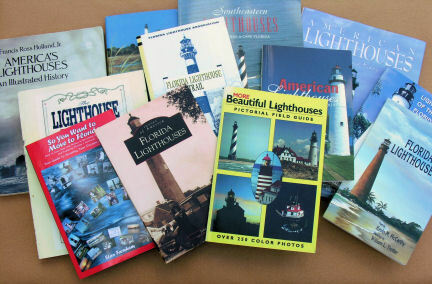 The FLA Online Store has numerous publications and lighthouse maps available. by James D. Snyder. Published by Pharos Books. Written by an historian of the National Park Service this book describes the founding and operation of over 200 of America's coastal and inland lighthouses. It contains over 100 historic engravings, draings and photographs. With beautiful color photos this book covers over 500 lighthouses on America's coasts and lakes. Details the history and architecture and provides full information on visiting or just viewing each of them. Details the origins of lighthouses and details their evolution from the earliest towers to modern marvels of architecture and automated technology. Bansemer's Book of Florida Lighthouses by Roger Bansemer; Pineapple Press, Inc. Written and fully illustrated by internationally known artist, Roger Bansmer, this book depicts Florida's thirty lighthouses in over 200 paintings and sketches. Contains interesting stories on each lighthouse and its surroundings. Cedar Keys Light Station The Cedar Keys Light Station on the island of Seahorse Key off Florida’s Gulf Coast has stood a solitary vigil for more than 157 years. This sturdy sentential has survived devastating hurricanes, the assault by Union troops, as well as years of abandonment. Learn the history of one of America’s lesser known treasures. Hardbound; 192 pages; illustrations; index. Limited edition printing of 500 books. The history of the Cape Canaveral area starting with the Ais Indians, the early homesteaders through the construction of the first brick lighthouse as well as the present iron lighthouse. Included are the stories of the lighthouse keepers and their families. Tom Taylor, who edited this book and wrote several of the lighthouse histories, was a founding member and past president of the Florida Lighthouse Association. The book contains numerous drawings by Paul Bradley. Available at the FLA Online Store. A visual tour of Florida's lighthouses through the use of vintage photographs. Generously illustrated with colored drawings by William Trotter, this book covers the construction, history and operations of all thirty of Florida's lighthouses and its one lightship. Several pages are devoted to each lighthouse, providing a map and detailed directions for reaching each one. Keepers of the Light by Myrna Robers Kanekkeberg. Chronicles Myrna's family who were keepers of the St. Marks Lighthouse for three generations. Can be purchased at The St. Marks National Wildlife Refuge gift shop, Wakulla County Historical Society shop in Crawfordville, Posh Gifts and Organics in Sopchoppy and Bo Lynn’s Grocery in St. Marks. A compendium of science, history and fascinating lore about the American Lighthouse compiled in almanac fashion by the month and date. The stories and histories of the twelve lighthouse of the Florida Keys. The six reef lights from Fowey Rock to Sand Key comprise the largest collection of wrought-iron skeletal lighthouses in the world. Love Dean was a boating enthusiast, both powered and sail, and operated her own boat for years. Comes with a clear plastic protective cover and is geared toward folks who travel to lots of lighthouses. It is a quick reference guide (complete with "spotter's notes) and includes images and brief information on many lights in the United States and Canada. Over 250 color photographs of lighthouse around the USA. Stan Farnham, FLA past president, wrote this book geared towards those contemplating a move to Florida, but it serves the present Florida residents as well. It is filled with valuable information on dealing with Florida regulations, saving money on home purchases and interesting things to do in Florida. It has one entire chapter devoted to Florida's lighthouses. For more information: SoYouWantToMoveToFlorida.com. Globe Pequot Press Beautifully illustrated with Bruce Roberts color photographs this book details the histories of the lighthouses of the South East coast.